Vintage Floral Birthday Card Image – Moon Lady with Poppies! Today I’m sharing this Colorful Vintage Floral Birthday Card Image! An pale sage green border surrounds an image of red and pink Poppies growing in front of a gray blue sky with quarter moon and the faint hint of a sleeping face. 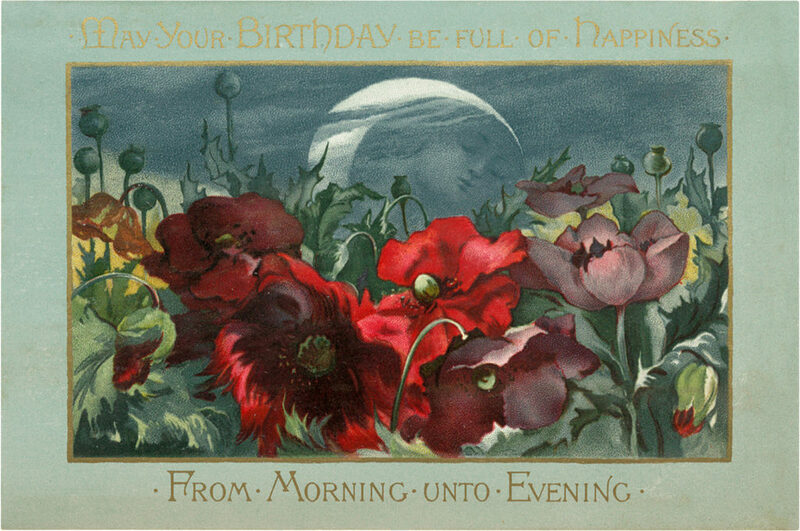 The sentiment reads, “May your Birthday be filled with Happiness from Morning unto Night” in a lovely gold font. It pairs beautifully with this Magnificent Water Lily Postcard and this Delightful Black Eyed Susan Postcard. So nice to frame or to use in your Craft or Collage Projects! « Wonderful Antique Ephemera Trade Card – Wisconsin Wool! This is really lovely! The image of the Moon Lady really makes this special!